Thong Nai Pan continues to remain a popular holiday destination. Despite gaining a reputation as a beach best suited for high-paying guests there are still reasonably and competitively priced rooms available on both beaches at such places as Baan Paanburi, Pingchan, Thong Tapan Resort and Sandee Bungalow. A study of other parts of the island reveal that the move to up-grade is happening all over Koh Phangan. For example the west coast of Koh Phangan that until recently was mostly frequented by long-term visitors and semi-permanent ex-pats who didn't mind staying next to mud flats and beaches with massive tidal differences has now become something of a hotspot. Srithanu and the beaches nearby such as Nai Wok, Haad Chao Phao, Plaay Laem, Hin Kong and Wok Tum are now known as a centre of spiritual excellence with numerous providers of yoga, reiki, detox-ing, irrigations, medical massage and other New Age treatments and instruction. 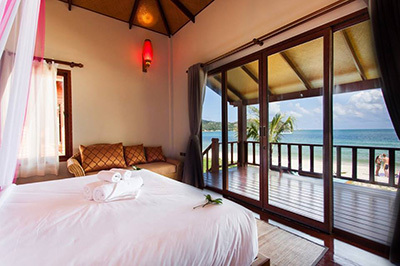 Hotels such as Kupu Kupu in Plaay Laem, Grand Sea Resort in Nai Wok and private villas for rent such as Tembusa Villa in Hin Kong and Sunset Hill Boutique Resort in Haad Chao Phao are catering for 4 and 5 star guests. Panviman, Rasananda and Santhiya have no longer an exclusive hold on high-paying and short-staying guests. For some the proximity to the facilities, bars, restaurants and shops of Thongsala as well as the yoga schools of Srithanu outweighs the needs of being next to a great beach. Others prefer a more traditional resort based holiday next to a sandy beach with good swimming. For this Thong Nai Pan remains. There are few items of news concerning Thong Nai Pan and travel. Firstly, the main road to Thong Nai Pan which is entirely concrete has had some work done to it for maintenance. The road was so long in the making that the earlier parts constructed have needed repairs. Koh Phangan Airport has come back on the radar. Theories abound about the possible transport hub near Thong Nai Pan. First it was on, then it was off and now it is maybe on again depending on whether Kannithi Aviation can find a loan of 2 billion Baht with low interest rates. The project is already 1.1 billion Thai Baht over-budget. There is no doubt a lot more to the story but facts are few and far between. 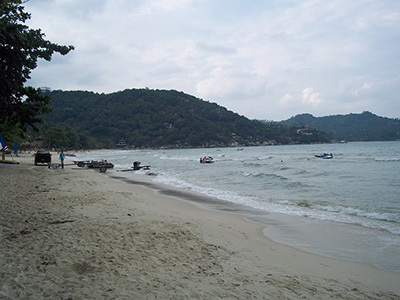 It was announced that the Bottle Beach to Thong Nai Pan Road would be upgraded in the future. The road running through the hills at the back of Thong Nai Pan Noi is going to become the last part of the main road going up the east coast. While getting passing traffic to bypass the village in Thong Nai Pan Noi is a good thing, the temptation for Buri Rasa to claim the public road down to the beach as well as Rasananda to close its part of the beach road is unabated. Vigilance is needed to prevent these things becoming de facto realities. In August a large contingent of police from the mainland arrived on the island with the mission of investigating building on official park land. Around the island little bits of designated park land (not for building or farming) have been appropriated for commercial use. There is the question of Than Sadet which is all national park status. The beach has Mai Pen Rai Bungalows and Plaa Than Sadet Resort. Talks are on-going with the locals and the government about the use of the beach. The police knocked down several structures on the west coast and other parts of the island. Thong Nai Pan Noi and Thong Nai Pan Yai have been unaffected by the 'clean-up' initiated by the army administration in Bangkok. In a side note, the police have visited Thong Nai Pan to call upon the local jet ski operators. Naturally no one was licensed and after several chats nothing much has changed. While there is still a medical centre at the northern end of Thong Nai Pan Yai, near the Middle School and temple accommodation more locals have been availing themselves of a doctor that is now visiting the area once a week. The step up in local medical coverage is analogous from having access to just a nurse to also having access to a general practitioner.